Analysis and policy prescriptions of major foreign policy issues facing the United States, developed through private deliberations among a diverse and distinguished group of experts. "The United States, through Alaska, is a significant Arctic nation with strategic, economic, and scientific interests," asserts a new Council on Foreign Relations-sponsored (CFR) Independent Task Force report, Arctic Imperatives: Reinforcing U.S. Strategy on America's Fourth Coast. With the Arctic "warming at twice the rate as the rest of the planet" and melting sea ice opening up this resource-rich region to new trade routes and commercial activities, the report stresses that "the United States needs to increase its strategic commitment to the region or risk leaving its interests unprotected." Chaired by Thad Allen, retired admiral and former commandant of the U.S. Coast Guard, and Christine Todd Whitman, former administrator of the Environmental Protection Agency and governor of New Jersey, the Task Force finds that the United States lags behind other Arctic nations that have "updated their strategic and commercial calculations to take advantage of the changing conditions stemming from the opening of the region." The report notes that while Russia has numerous ice-breaking vessels and China is building a third icebreaker, the United States owns only two operational icebreaking ships—one heavy icebreaker and one medium-weight icebreaker—to serve both the Arctic and the Antarctic. Asserting that "icebreakers are a national capacity" required for a range of maritime missions to support U.S. security, economic, and commercial needs, the Task Force recommends that the United States fund and build additional icebreakers. 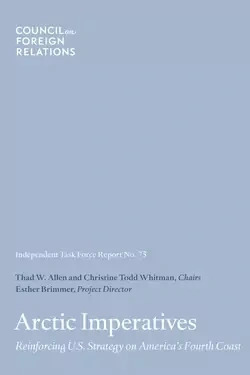 The report also finds that the United States needs greater investment in Alaskan infrastructure, including deepwater ports, roads, and reliable telecommunications, to support economic development and a sustained security presence in the region. Currently, "almost no marine infrastructure is in place within the U.S. maritime Arctic." The bipartisan Task Force is composed of twenty experts from diverse backgrounds. The project is directed by Esther Brimmer, executive director and chief executive officer of NAFSA: Association of International Educators, and a recent CFR adjunct senior fellow for international institutions. Ratify the UN Convention on the Law of the Sea. The Senate should help secure the United States' legal rights to more than 386,000 square miles of subsea resources along its extended continental shelf by ratifying this treaty. Fund and maintain polar ice-breaking ships. Congress should approve funding for up to six icebreakers to improve operational capacity in the Arctic, so as to have at least three operational ships in the polar regions at any one time. Improve Arctic infrastructure. Invest in telecommunications, energy, and other infrastructure in Alaska and find locations for safe harbor ports and a deepwater port. Strengthen cooperation with other Arctic nations. Continue diplomatic efforts within the Arctic Council and work with other Arctic states, including Russia, on confidence-building and cooperative security measures. Support sustainable development and Alaska Native communities. "Maintain the [Arctic] Council's focus on sustainable development, environmental protection, and continued involvement of the Arctic's indigenous peoples." Fund scientific research. Sustain budget support for scientific research beyond 2017 to understand the regional and global impact of accelerated climate change. For a full list of the Task Force's findings and recommendations, read the report [PDF], Arctic Imperatives: Reinforcing U.S. Strategy on America's Fourth Coast. Professors: To request an exam copy, contact publications@cfr.org. Please include your university and course name. Thad W. Allen, Booz Allen Hamilton, Inc. The Arctic should be a major consideration in discussions of U.S. national security, says Thad Allen, co-chair of CFR’s Independent Task Force on the Arctic.